Now the feed viewer will not be showing, but the data will be displayed in XML. Then I was able to see the XML J while it works without needing to do anything in Chrome … Ya I hear you but what to do. This has nothing to do with SharePoint 2013 but it has to do with XML in IE. I have been thinking what to write about my experience in the ESPC .. but I thought if I kept thinking I will forget and get more busy and won’t write anything which is the thing that happens a lot. So I thought I just open the document and write what I experienced and that will be more from my heart than being arranged in bullets. This is not a technical article anyway. The Conference was in a great venue, the organizers did really hard work to make it happen in that way. THANK YOU AGAIN & AGAIN. Great sessions, Impressive keynotes. Around 1500 attended, 78 sponsor, 90 sessions. SharePointers who really love this product, you will find them; helpful & Volunteer people.. help you find what you need, solves your problem, try to find solution with you and more.. and on top of this they are collaborative people indeed .. it is my experience with most of the conferences & events too. ESPC Dinner was really amazing gathering, I was really happy to be there, I meet people I only follow them on Twitter or FB or there blogs & who they follow me too, I meet them in person; which is really v nice J and hope to see them again soon. As always best speaker ever Raffel Lukawiecki, this time he had a keynote which is really valuable. SharePointers Ladies: Agnes Molnar, Erica Toelle & Sonja Madsen. Actually more and more and more.. people I never knew but was amazing and talented, like Mike Fitzmaurice gorgeous, his experience was really obvious. I call them my friends, Joel Oleson, Michael Noel, Paul J. Swider, and I hope Bjørn Furuknap doesn’t mind to call him friend too who gave me lots of advices there and I really enjoyed listening to him ” I will do it, I didn’t forget “. I will not make it long, let me share some pics I have honor to meet those people with me. 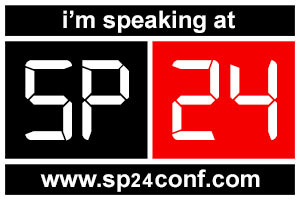 If you missed it .. try to don’t miss it next year, it is yearly Europe SharePoint Conference ..